This release is a bit of a strange one for us. Ultimately much of our record collection between the years of 2005 – 2008 was heavily skewed towards anything the ED Banger crew could throw a distorted synth at. With Uffie – Pop The Glock, Sebastian – Ross Ross Ross, Justice – Waters Of Nazareth (Erol Alkan Remix), Mr Flash – Disco Dynamite and DJ Mehdi – Signatune (Thomas Bangalter Edit) being the sort of records, that like your best girl, you wouldn’t leave at home on a Saturday night. That said from 2008 onwards, around the time of their third compilation ED Rec Vol III, that influence had begun to wane. 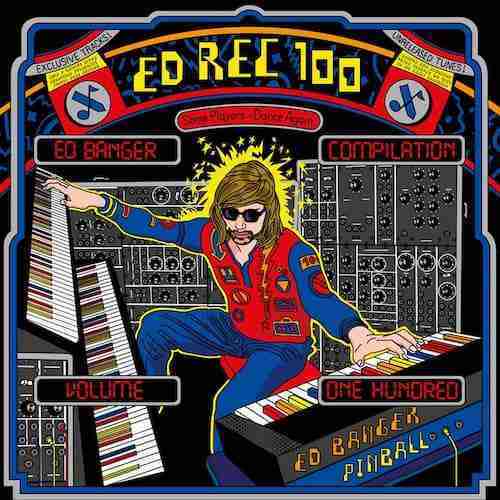 And from 2009 onwards ED Banger was like an ex-girlfriend, regrettable forgotten. So here they are, back again, 9 years on from our original breakup, with a 17 track compilation featuring, in the most part, the original crew. But is the old magic still there, and can they win us back after a 9 year absence? Hard to say, the music scene has moved on dramatically since ED Banger’s heyday, and much like our recent post regarding Soulwax – Is It Always Binary again the issue will be whether their music can get the current crop of kids dancing? Justice aside, who have disappointingly elected not to provide an original track, the one name that potentially could rekindle forgotten passions, is the enigmatic and somewhat prodigal – ‘Sebastian’. Of all the ED Banger crew he was by far and away the people’s favourite. Elusive, frustratingly hard to book – we never managed it, far to slow to release records, yet wildly irresistible. Take his standout moment ‘Ross Ross Ross‘, a record that can still be dropped with devastating effect.